It's Cinco de Mayo. The parties have been planned. The tequila is flowing. The problem? You're pregnant (or maybe you don't drink). Never fear, em is here! We've got a great non-alcoholic margarita recipe for you! This yummy recipe makes 8 - 4oz servings and will be sure to put you in the festive mood with everyone else. 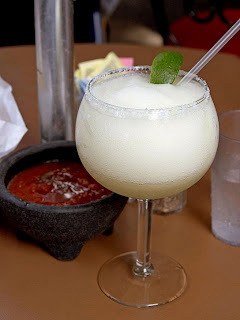 If desired, rub rims of margarita glasses with lime wedge; dip rims into a shallow dish of coarse salt and shake off excess. Set aside. Combine limeade concentrate, orange juice and grapefruit juice in a blender. Cover and blend until smooth. For a frozen drink, leave the juice mixture in the blender and, with the blender running, gradually add ice cubes through the hole in the lid and blend until slushy. Pour into glasses and garnish with lime wedges if desired. Pretty easy, huh? Even better, these drinks are fat-free and only 58 calories each! Enjoy and remember to live mindfully!